Finally I watched "Sanju" this evening at The INOX Bhubaneswar. First things first -- Ranbir Kapoor stands out in an otherwise decent flick. He is simply brilliant in the movie. A proven talent with some truly amazing performances as in Barfi, Rockstar, Rocket Singh: Salesman of the Year, Wake Up Sid, Raajneeti and Ae Dil Hai Mushkil, Ranbir Kapoor has given it all to the titular role he portrays in this movie and he thoroughly deserves all the plaudits. Having said that, although 'Sanju' is continuing its magnificent run at the box office, having earned both critical acclaim and appreciation from the audience alike, but I am disappointed with the movie. I was expecting an honest biopic, the movie too was being proclaimed as an undiluted portrayal of a flawed human being but sadly "Sanju" isn't one. The movie starts with a guy named Mr. Tripathi reading out a passage to Sanjay Dutt from a book he has written about the star's life, where he has drawn parallels between the lives of Bapu (Mahatma Gandhi) and Baba (Sanjay Dutt) but the comparision outrages Dutt so much that he throws Mr. Tripathi out of his house. The scene was meant to convey that Dutt was looking for a biographer who could tell an honest, unprocessed account of his life. The movie, instead, is a one-sided defense of Dutt’s misdeeds. "Sanju" tells us the story of Sanjay Dutt, an acclaimed actor and the son of Nargis (a screen legend herself) and Sunil Dutt (a much-revered actor, activist and politician) and takes us through the ups and downs in his life -- how his debut film happened, how he lost his mother Nargis to cancer when he was still young; his strained relationship with his father; being misguided, how he gets addicted to drugs and alcohol; the allegations of his involvement in the 1993 Mumbai bomb blasts and his subsequent arrest under TADA, his acquittal of terror charges but conviction under the Arms Act, his jail term and ultimately his release. While Ranbir Kapoor plays the titular role, Paresh Rawal has essayed the role of his father, Sunil Dutt and Manisha Koirala that of his mother, Nargis. The supporting cast include Dia Mirza (playing Maanyata Dutt, his wife), Vicky Kaushal as his long time friend, Sonam Kapoor as his past beloved and Anushka Sharma as the biographer penning his story. "Sanju" might have been a flawed biopic but the silver lining is the performance of Ranbir Kapoor - absolutely stupendous. He has ably proved that he is definitely one of the best actors India has at the moment. What stands out is his ability to transform into his roles. Much may be made of his bodily transformation but they do not really compare to his transformation into Dutt's character. Ranbir's portrayal of Sanjay Dutt isn't as much about an actor possessing a character, as it is an outright forging one into being! Be it growing long hair and sweating out at the gym to bulk up for one of Dutt's looks or getting his mannerisms accurate, from mimicking Dutt's typical hand movements to his walk, Ranbir has pulled off Dutt's persona flawlessly in the movie, so much that there have been several moments when Ranbir looks like a spitting image of Sanjay Dutt! Not just in the transformation but he is also superb in enacting the role. Especially in the scenes of emotional intensity, he brings out an extraordinary sensitivity to his portrayal. Thus Ranbir thoroughly deserves all the praises being showered on him for the ease with which he slips into the various stages of Dutt's life in the movie. The supporting cast too have done a commendable job, especially Vicky Kaushal playing Sanju's close confidante and long time ally Kamli, who stands by Dutt's side through his thick and thin in life. Although the character of Kamlesh Kapasi (or Kamli) seemed slightly half baked to me, but he has done a sincere job. Even though their roles were brief but the two ladies - Manisha Koirala as his ailing mother Nargis Dutt battling cancer and Dia Mirza as his supportive wife and pillar of strength were impressive too. However, Paresh Rawal looked miscast as Sunil Dutt in terms of looks, though, being a seasoned actor that he is, he makes it up with his beautiful portrayal. The makers have whitewashed several major facts about Dutt's life that could have raised uncomfortable questions. Throughout the movie, Sanjay Dutt is portrayed as well-meant and good natured but a misguided person. The movie tries to paint Dutt as a helpless victim of the circumstances - a Bechara - who has been wrongly perceived as a Khal Nayak or a bad boy by the media while blaming others for the star's wrongdoings and failings. Abhijat Joshi and Hirani – the movie's story writers have taken liberties, unabashedly cherrypicking facts to create an impression that it was the media who was being on a witch-hunt of sorts and wrongly framed Sanjay Dutt in the 1993 Mumbai blasts case and that he never had any connection with the underworld (whereas the recording of Dutt's telephonic conversation with Dawood's aide Chhotaa Shakeel is all too well-known). One can understand that it may not be possible to show every aspect of a person's life in his biopic but to brush aside some major chapters of his life is bound to raise a few eyebrows. For instance while we are introduced to Dutt's third wife Maanyata and their two kids, but his earlier two marriages have been conveniently omitted by the makers. Nothing is told, not even once, about his first wife Richa Sharma and how Dutt had filed for divorce in 1993 while she was still undergoing treatment for cancer in USA, because apparently he had fallen deeply in love with Madhuri Dixit at that time and wanted to marry her. (Richa died of cancer 3 years later, leaving behind their daughter Trishala but again, nothing is said about Trishala too in "Sanju". Neither is anything said about his second wife Rhea Pillai and their consequent divorce. Okay, agreed that they were his past and that it was his personal life; that the viewers need not need to know everything about it, but then when the protagonist unabashedly claims to have slept with almost 350 women, don't his first two wives whom he had legally married, deserve a place, at least a mention, in the pages of his lifestory being told? "Sanju"s music is quite flat. Apart from the track "Kar Har Maidan Fateh", sung beautifully by Sukhwinder Singh and Shreya Ghoshal, none of the other tracks leave any mark. Right from the time of its inception, the movie has been making headlines. But to be very honest, the first time when I heard about a biopic being made on Sanjay Dutt's life, I wasn't too enthusiastic about the news. However upon learning that the direction would be helmed by none other than Raju Hirani, it made me a little curious. Because going by his past works (each one being truly phenomenal), one would not expect anything less than the best from Hirani. And then as the pictures of Ranbir Kapoor's unbelievable transformation for the titular role found their way on social media, it got me excited. But sadly, the movie doesn't meet my expectations. It's a well-known fact how much director Raju Hirani adores the protagonist in real life. So rather than being a biopic, "Sanju" seemed more like a PR exercise being done for Sanjay Dutt. 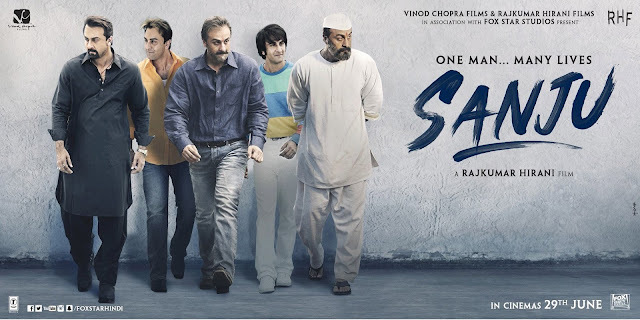 "Sanju" won't seem that bad if seen only as a movie and not as a biopic; it's a fairly engaging movie and a "must watch" one, solely for Ranbir Kapoor's portrayal. But I wouldn't term the movie as a masterpiece. Coming from arguably one of India's best directors and a master storyteller, Rajkumar Hirani, "Sanju" sadly doesn't measure up to his previous movies!